Happy Monday! Today my friends at The Blended Blog are talking Gift Guides. I've gotten many great ideas from gift guides over the years, so be sure to hop over and link up yours. I wanted to share something a little different. Tomorrow is Giving Tuesday, a global day of giving - of your time, a donation, or a gift to your local community. Facebook is partnering with PayPal again this year to match donations made on Facebook to nonprofits, up to $7 million. Ronald McDonald House Charities - allows families to access specialized medical treatment by providing a place to stay at little or no cost. Born Just Right - focused on building creative solutions that help kids with differences live a more enjoyable life. Military Mama Network - supporting troops, veterans, and their families. Bernie's Book Bank - providing books to children in need. And there are thousands more! T'is the season for giving...what will you give? Love this and I too didn't want to share just a gift guide over at TBB today and didn't even on my own blog. We give to lots of charities every year and these are GREAT ones! There's some great charities out there! What a sweet and unique idea for a gift guide. You are just so thoughtful! This is exactly the spirit of the season, Lana. Which is why I love you. I absolutely love this idea! 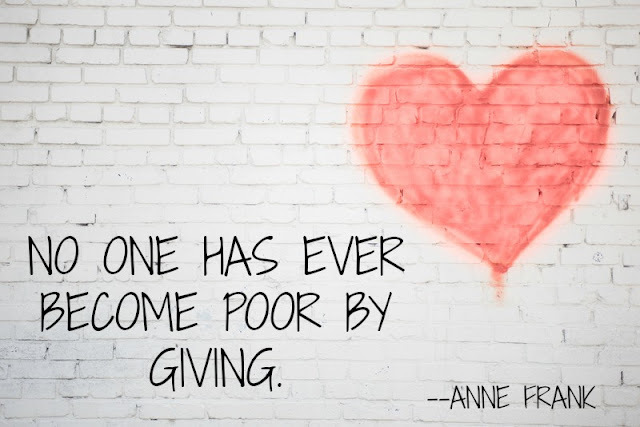 Giving is the way to go, especially when you're giving of yourself - your time and your talents! Thanks for sharing this! I especially love to give my time! This is amazing. Thank you. It's exactly the list I need for tomorrow! Just love that Anne Frank quote and it is so, so true! I didn't know tomorrow was Giving Tuesday, such a great day to have after Black Friday/Cyber Monday. It's the perfect time for it! Love this post and your focus on giving. Hugs!